InfluxDays NYC was my first InfluxDays, and to say I was impressed would be an understatement. After spending two days with community members and hearing about how they’re using our products coupled with all the talks, I was even more energized and excited about what we’re building. We had a great turnout for the event — plus, it was livestreamed, so people from around the world who weren’t in New York City were able to tune in as well. Paul Dix started the first day off on a high note, talking about the future and vision of the InfluxData platform, giving a roadmap for InfluxDB 2.0. Next up was community member and InfluxAce Matt Iverson from Optum, a division of UnitedHealth Group, discussing their monitoring journey and how Optum is reducing snowflakes with automatic deployment using their open source tool they call Lighthouse. Tim Hall, our VP of Products at InfluxData, wrapped up the morning by showcasing how to set up and use InfluxCloud 2.0. We came back after lunch and heard from Jacob Lisi, a Software Engineer at Grafana Labs, demonstrating Flux with Grafana, how Flux supercharges queries, discussing the features as well as moving parts for deployment, and how to use it with Grafana. Richard Laskey, Senior Software Engineer at Wayfair, took the stage next to share the monitoring best practices for InfluxEnterprise that they use to monitor their storefront. Next up, our Director of Engineering, Ryan Betts, talked about InfluxData internals, sharing lessons learned about scaling the platform across a large number of deployments. Rounding out the day, we heard from Krisha Krishnaraju, Rajeev Tomer, and Karl Daman from Capital One about the need for architecting for disaster recovery for time series data as well as sharing their journey to plan and execute a disaster recovery plan. After wrapping up the talks, we had a cocktail happy hour, giving us a time to network with other attendees. On Day 2, we had workshops focusing on two tracks — v1 and v2, with talks covering topics like an in-depth intro to InfluxDB 2.0 and Flux queries, optimizing InfluxDB 1.0, building Telegraf plugins, architecting InfluxEnterprise, dashboarding, container monitoring, client libraries, and InfluxDB for IoT. Seriously, thank you to all of our users who came out from all over the continent to join us, and for the great speakers who shared their experiences and lessons learned. If you weren’t able to catch the event in NYC or on the livestream, or if you just want to see the talks again, we’ve got the videos, all of the slide decks from the speakers, and great photos. We also want to give a huge shoutout to Grafana Labs, AWS, and Google Cloud who sponsored this event! 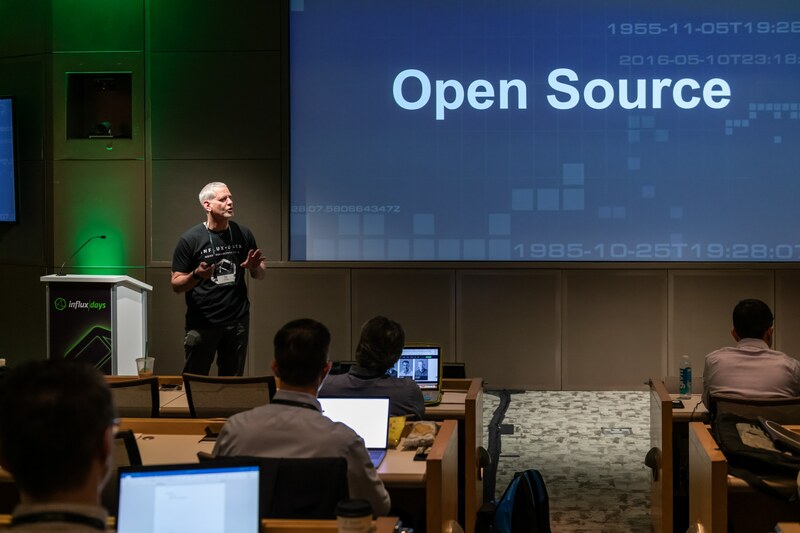 If you missed InfluxDays NYC, no worries — InfluxDays 2019 London is only a few weeks away. We’ll be gathering on June 13-14, 2019 at The Brewery, 52 Chiswell Street, London, EC1Y 4SD. Like our NYC event, we’ll have talks on the first day with hands-on workshops on Day 2. The workshops will be on two tracks, a Getting Started Track and a More Advanced Track, guaranteeing that there really is something for everyone. Registration is open and tickets are available from only £199. Use promo code BLOG to save 20%. See you in London!